Autodesk has challenged us to raise $5,000 which they will match. Every dollar we raise toward that goal effectively doubles. Donate now for a great return on investment! Some of the conversations we have in Transition initiatives are challenging. Different hoped-for outcomes, tactics, and communication styles can make meetings and activities hard. But Transition can be a great deal of fun. Co-creating the new world that we know in our hearts is possible is joyful and exciting work. Join this call to get strategies for engaging in challenging conversations with grace and a sense of play. Hosted by the International Society for Ecology and Culture (ISEC), the conference will cover a range of interconnected topics, including public policy choices; local initiatives in food,energy, education, business and banking; the need to bridge the North-South divide; and the influence of the economy on our psychological well-being. Presenters include Vandana Shiva, Bill McKibben, Annie Leonard, Sulak Sivaraksa, Michael Shuman, Joanna Macy, Gustavo Esteva, Richard Heinberg and many more. The course is taught by pioneers and leaders of the Transition movement including Rob Hopkins, Naresh Giangrande and Sophy Banks. Read the Worldwide Roundup of What's Happening out in the World of Transition - including Prince Charles using the Brixton Pound! Take a moment to breathe in the possibilities of this time. We are in the midst of a profound shift, a tipping point. Now, more than ever let's give it our all, step it up, galvanize our efforts. That's what's called for. High leverage ways of helping are: Working with Transition US to build a challenge grant of $25,000 so we can charge into 2012 with full strength and doubled dollars; contributing your expertise to fulfill strategic volunteer needs; and more than ever, working on your local resilience-building projects at home, with your neighbors and in your community. This is the time when ordinary people are becoming extraordinary. Will your community bring us to #111 before the end of the year? Browse the initiatives map and learn more about becoming an Official Transition Initiative! Please join us in delivering a big thank you this month to David Johnson. David was involved in a think tank set up by Rob Hopkins in the early days of Transition Town Totnes and resides in Portland, Oregon where he has been involved with Transition PDX. Having served several years on the Transition US Board, he has been a very valuable member of the team and is now stepping away to focus on other projects. You can read some of his past writings on Transition here. We wish him all the best. In her twelfth book, The Empowerment Manual: A Guide for Collaborative Groups, Starhawk draws on four decades of experience in circles and collectives to show us how to foster connection, clear communication, and positive power in ourselves and our groups. 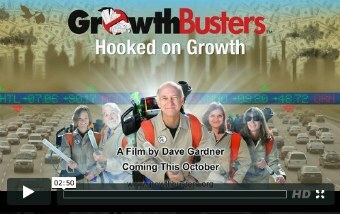 Growthbusters is out! We're pleased to share this film with you, which recently premiered with Transition folks in Colorado, San Francisco Bay Area. The film features members of the Transition US team: Trathen Heckman, Dave Room & Carolyne Stayton - all in it talking about Transition. The new version of the 'Transition Primer' (US version) is now available. It has a fresh new look as well as new sections on peak oil, exponential growth, and resilence indicators. A future version will include sections on topics such as working with local government. We would love to hear what you think and any additions you feel would be helpful for those embarking on this journey called Transition. DITCHING WALL STREET: What if instead of trying to fix Wall Street, we ditch it? Post Carbon Fellow Michael Shuman argues that the answer is to invest in local economies. Michael is the author of PCI's forthcoming book Local Dollars, Local Sense: How to Shift Your Money from Wall Street to Main Street and Achieve Real Prosperity to be be published by Chelsea Green in early 2012. Check out the article and sign our petition calling on Congress to legalise local investment! Want to know more about PCI? Read Richard Heinberg's latest article What We Are For!